It was a must try when in Singapore, and we managed to try it in our first visit to Singapore. I booked in advance as I had no idea how popular it would be. It turned out that I didn’t need to during the time i visited (a weekday after Christmas). [At least for the National Museum location]. 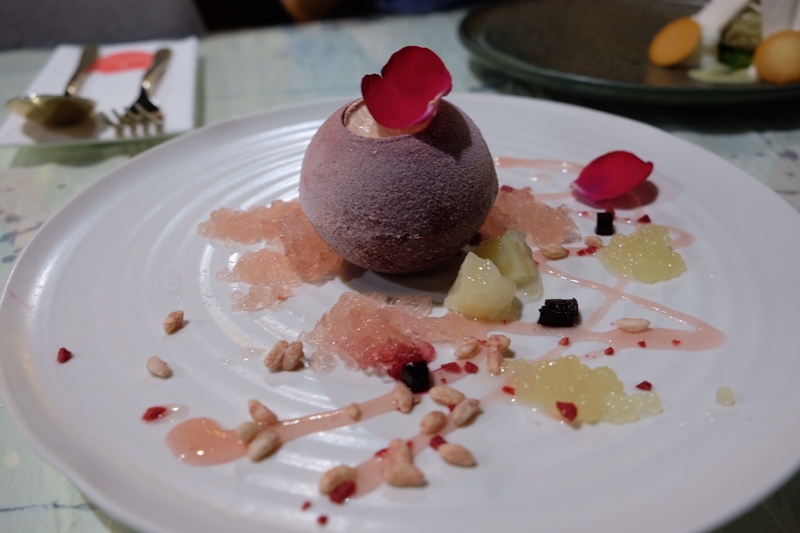 Having already opened one in Hong Kong and just opened one in Macau, shows how much Janice, the dessert queen wants to expand to the rest of the world with her art. And I think she should! If she could break into Australia it would be good too as I only knew about her from challenging the Masterchef contestants with her Chassis Plum signature dessert. I must say every dish was impeccable, smart and artistically displayed. I was unable to meet her, but her team does well. Socialising and ensuring the guests are looked after by the dietary requirements and the amount of food tasted. Entree started with 5 artistic savoury dumplings. Can’t believe how it can be so pretty! The dish is called their Signature 5 Dumplings. As you can see from the card below, each dumpling follows its theme and would recommend from eating left to right due to intensity of the flavours. Starting with Elastic Truffle Mushroom, Crystal Scallop Prawn, Transparent Yuzu Milk Cabbage, Matte Pork Shrimp Chives and finally Crispy Skin Dried Scallop Radish Puff. Crystal just looks too perfect, but tasted not too different to any prawn dumpling. Couldn’t taste the scallop unfortunately. My favourite was the Matte Pork Shrimp Chives – thankfully we ordered a whole dish of it separately! All others were yummy, but in terms of quantity, I could keep eating the Pork Shrimp Chives dumpling. Crispy Skin Dried Scallop Radish Puff was a delicate dish and I know its hard to make so that was another hit to my list. Truffle Pork Gyoza Dumplings was also a hit on their menu – we asked for the waitress’ recommendation and yes it was delicious. Can’t go wrong with truffle! We did ask them to separate the chilli, so it may look different to the standard dish. The purple is just a fried piece of sweet potato enhancing the earthiness to the “truffle” dish. Crispy Charcoal Nest was another great one – we had the duck, but after looking online into the menu again, it says pork belly. I definitely tried duck – so maybe it’s recently changed menu. The meat fell off the bone and every elements was beautiful – just look at the presentation! The red dots were some sort of raspberry coulee for some acidity balance. The Mushroom poem paper makes it so romantic – had to ask the waitress if it’s edible – I confirm it is edible. But I felt it was tasteless. Scallop Somen Sakura Ebi, Ikura was my favourite savoury dish. It looks so simple but it’s bursts with freshness and flavour from the roe. The scallops were beautifully cooked and the somen noodles were thin enough meeting the delicacy of the dish. I couldn’t taste what the drizzled oil was – maybe olive oil? Cassis plum – bombe, yoghurt elderflower foam, plum liqueur textures. This was the dish that Janice offered to challenge the Masterchef contestants a couple of years ago – don’t have too much, you might get drunk! It’s was the better dessert out of the two we tried. It was beautiful. The cassis is strong throughout every bite. Thankfully there were the crumbled jellies that tasted acidic to balanced it out. Watch out for what’s inside – it was actually quite chilled when I bit into the centre. My teeth got a bit of a tingle! Maybe wait a bit longer once the centre had defrosted. As for decor, 2am dessert used colour dye mixed with melted chocolate in many jars. You can see of varying shades of orange, they made each jar unique. Smart and meeting the theme of the restaurant – painting art on food. Overall, it was a beautiful and unimaginable experience. It wasn’t busy so we got our food just in time for our bellies. Had our own waitress and had plenty of time to dine. The price for something as inspiring and fancy is affordable for a date night in Singapore. It turned out to be around $160SGD, so maybe $150AUD. I would try their restaurants in Hong Kong or Macau when I visit these cities next.